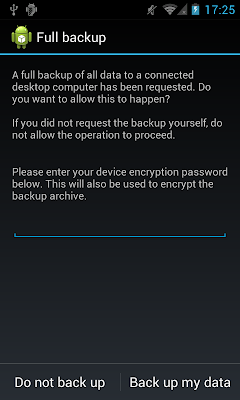 Last time we discussed how to access the SIM card and use it as a secure element to enhance Android applications. One of the main problems with this approach is that since SIM cards are controlled by the MNO any applets running on a commercial SIM have to be approved by them. Needless to say, that considerably limits flexibility. Fortunately, NFC-enabled Android devices can communicate with practically any external contactless smart card, and you can install anything on those. Let's explore how an NFC smart card can be used to sign email on Android. As discussed in previous posts, a smart card is a secure execution environment on a single chip, typically packaged in a credit-card sized plastic package or the smaller 2FF/3FF/4FF form factors when used as a SIM card. Traditionally, smart cards connect with a card reader using a number of gold-plated contact pads. The pads are used to both provide power to the card and establish serial communication with its I/O interface. Size, electrical characteristics and communication protocols are defined in the 7816 series of ISO standards. Those traditional cards are referred to as 'contact smart cards'. Contactless cards on the other hand do not need to have physical contact with the reader. They draw power and communicate with the reader using RF induction. The communication protocol (T=CL) they use is defined in ISO 14443 and is very similar to the T1 protocol used by contact cards. While smart cards that have only a contactless interface do exist, dual-interface cards that have both contacts and an antenna for RF communication are the majority. The underlying RF standard used varies by manufacturer, and both Type A and Type B are common. As we know, NFC has three standard modes of operation: reader/writer (R/W), peer-to-peer (P2P) and card emulation (CE) mode. 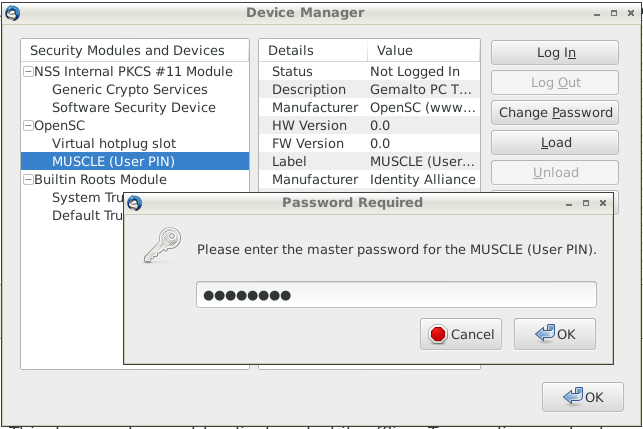 All NFC-enabled Android devices support R/W and P2P mode, and some can provide CE, either using a physical secure element (SE) or software emulation. All that is needed to communicate with a contactless smart card is the basic R/W mode, so they can be used on practically all Android devices with NFC support. This functionality is provided by the IsoDep class. It provides only basic command-response exchange functionality with the transceive() method, any higher level protocol need to be implemented by the client application. There have been quite a few new services that are trying to reinvent secure email in recent years. They are trying to make it 'easy' for users by taking care of key management and shifting all cryptographic operations to the server. As recent events have reconfirmed, introducing an intermediary is not a very good idea if communication between two parties is to be and remain secure. Secure email itself is hardly a new idea, and the 'old-school' way of implementing it relies on pubic key cryptography. Each party is responsible for both protecting their private key and verifying that the public key of their counterpart matches their actual identity. The method used to verify identity is the biggest difference between the two major secure email standards in use today, PGP and S/MIME. PGP relies on the so called 'web of trust', where everyone can vouch for the identity of someone by signing their key (usually after meeting them in person), and keys with more signatures can be considered trustworthy. S/MIME, on the other hand, relies on PKI and X.509 certificates, where the issuing authority (CA) is relied upon to verify identity when issuing a certificate. PGP has the advantage of being decentralized, which makes it harder to break the system by compromising a single entity, as has happened with a number of public CAs in recent years. However, it requires much more user involvement and is especially challenging to new users. Additionally, while many commercial and open source PGP implementations do exist, most mainstream email clients do not support PGP out of the box and require the installation of plugins and additional software. On the other hand, all major proprietary (Outlook variants, Mail.app, etc) and open source (Thunderbird) email clients have built-in and mature S/MIME implementations. 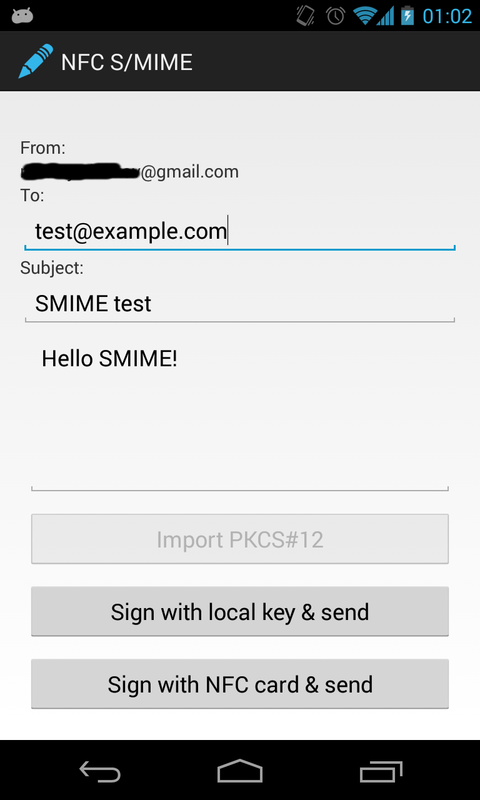 We will use S/MIME for this example because it is a lot easier to get started with and test, but the techniques described can be used to implement PGP-secured email as well. Let's first discuss how S/MIME is implemented. The S/MIME, or Secure/Multipurpose Internet Mail Extensions, standard defines how to include signed and/or encrypted content in email messages. It specified both the procedures for creating signed or encrypted (enveloped) content and the MIME media types to use when adding them to the message. 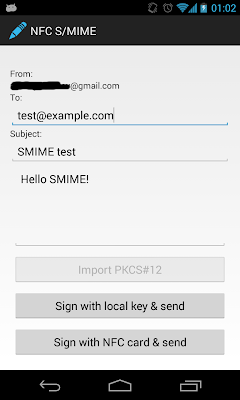 For example, a signed message would have a part with the Content-Type: application/pkcs7-signature; name=smime.p7s; smime-type=signed-data which contains the message signature and any associated attributes. To an email client that does not support S/MIME, like most Web mail apps, this would look like an attachment called smime.p7s. S/MIME-compliant clients would instead parse and verify the signature and display some visual indication showing the signature verification status. Besides the signature value and algorithms used, SignedInfo contains signer identifier used to find the exact certificate that was used and a number of optional signed and unsigned attributes. Signed attributes are included when producing the signature value and can contain additional information about the signature, such as signing time. Unsigned attribute are not covered by the signature value, but can contain signed data themselves, such as counter signature (an additional signature over the signature value). To sum this up, in order to produce a S/MIME signed message, we need to sign the email contents and any attributes, generate the SignedInfo structure, wrap it into a SignedData, DER encode the result and add it to the message using the appropriate MIME type. Sound easy, right? Let's how this can be done on Android. On any platform, you need two things in order to generate an S/MIME message: a cryptographic provider that can perform the actual signing using an asymmetric key and an ASN.1 parser/generator in order to generate the SignedData structure. 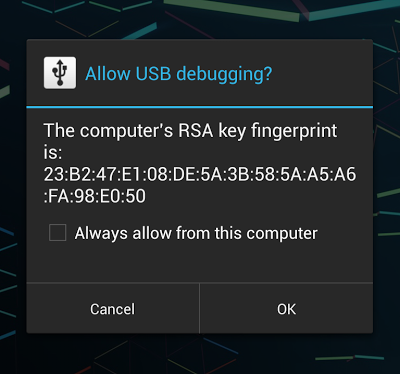 Android has JCE providers that support RSA, recently even with hardware-backed keys. What's left is an ASN.1 generator. While ASN.1 and DER/BER have been around for ages, and there are quite a few parsers/generators, the practically useful choices are not that many. No one really generates code directly from the ASN.1 modules found in related standards, most libraries implement only the necessary parts, building on available components. Both of Android's major cryptographic libraries, OpenSSL and Bouncy Castle contain ASN.1 parser/generators and have support for CMS. The related API's are not public though, so we need to include our own libraries. As usual we turn to Spongy Castle, which is provides all of Bouncy Castle's functionality under a different namespace. In order to be able process CMS and generate S/MIME messages, we need the optional scpkix and scmail packages. The first one contains PKIX and CMS related classes, and the second one implements S/MIME. However, there is a twist: Android lacks some of the classes required for generating S/MIME messages. As you may know, Android has implementations for most standard Java APIs, with a few exceptions, most notably the GUI widget related AWT and Swing packages. Those are rarely missed, because Android has its own widget and graphics libraries. However, besides widgets AWT contains classes related to MIME media types as well. Unfortunately, some of those are used in libraries that deal with MIME objects, such as JavaMail and the Bouncy Castle S/MIME implementation. JavaMail versions that include alternative AWT implementations, repackaged for Android have been available for some time, but since they use some non-standard package names, they are not a drop-in replacement. That applies to Spongy Castle as well: some source code modifications are required in order to get scmail to work with the javamail-android library. Here we first get the signer key and certificate using the KeyChain API and then create an S/MIME generator by specifying the key, certificate, signature algorithm and signed attributes. Note that we specify the AndroidOpenSSL provider explicitly which is the only one that can use hardware-backed keys. This is only required if you changed the default provider order when installing Spongy Castle, by default AndroidOpenSSL is the preferred JCE provider. We then add the certificates we want to include in the generated SignedData and generate a multi-part MIME message that includes both the original message (mimeMsg) and the signature. Finally we send the message using the JavaMail Transport class. The JavaMail Session initialization is omitted from the example above, see the sample app for how to set it up to use Gmail's SMTP server. This requires the Gmail account password to be specified, but with a little more work it can be replaced with an OAuth token you can obtain from the system AccountManager. So what about smart cards? If the certificate installed in the card has your email in the Subject Alternative Name extension, you should be able send signed and encrypted emails (if you have the recipient's certificate, of course). But how to achieve the same thing in Android? After that the signed message can be generated exactly like when using local key store keys. Of course, there are a few caveats. Since apps cannot control when an NFC connection is established, we can only sign data after the card has been picked up by the device and we have received an Intent with a live IsoDep instance. Additionally, since signing can take a few seconds, we need to make sure the connection is not broken by placing the device on top of the card (or use some sort of awkward case with a card slot). Our implementation also takes a few shortcuts by hard-coding the certificate object ID and size, as well as the card PIN, but those can be remedied with a little more code. The UI of our homebrew S/MIME client is shown below. 0000 - 88 bd 87 84 15 53 3d d8-72 64 c7 36 f8   .....S=.rd.6. 001a - 7d 2e 0b 08 b4 b7 e7 6c-e9 b6 61 00 13   }......l..a..
0027 - 25 62 69 2a bc 08 5b 4c-4f c9 73 cf d3   %bi*..[LO.s..
0034 - c6 1e 51 c2 5f c1 64 77-3b 45 e2 cb      ..Q._.dw;E..
Email encryption using the NFC smart card can be implemented in a similar fashion, but this time the card will be required when decrypting the message. Practically all NFC-enabled Android devices can be used to communicate with a contactless or dual-interface smart card. If the interface of card applications is known, it is fairly easy to implement an Android component that exposes card functionality via a custom interface, or even as a standard JCE provider. The card's cryptographic functionality can then be used to secure email or provide HTTPS and VPN authentication. This could be especially useful when dealing with keys that have been generated on the card and cannot be extracted. If a PKCS#12 backup file is available, importing the file in the system credential store can provide a better user experience and comparable security levels if the device has a hardware-backed credential store. Hi. I'd like to know which vendor/model of the NFC smart card you using? look like it hard to find a useable one. NXP J3A081, like it says in the article. Pretty much any recent dual interface one should work though. thanks! find some online supplier can provide this. 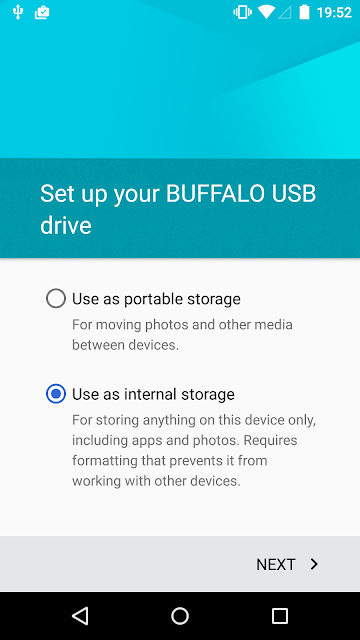 Can you share the sample android project ? It's Github, link is in the blog post. Hi, I don't know how relevant is this post here - but I thought let me just share. We are designing a solution which will accept a Digital Certificate stored inside an external device connected to your phone using the AudioJack. This certificate can then be used to Sign or Encrypt/Decrypt document / mails.